After a long winter's sleep, Tehachapi's only public pool will open its doors April 1, and the water will be three degrees warmer. "People have had the perception that the water is not warm. In years past, we kept the water at 80 degrees. 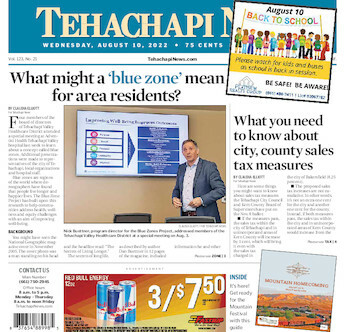 For the past three years, we have upped the water to 83 degrees, which is actually a big deal, and a significant amount of more heat," said Corey Torres, recreation supervisor for Tehachapi Valley Recreation & Park District. Torres said the reason for the temperature change was to keep lap swimmers and aerobic exercisers more comfortable. Said Torres, "We want to increase participation at the pool, and I know that is kind of a big hurdle for people who think it is too cold. We are trying to keep it as warm as we can." The season will kick off with lap swim in the six-lane, 25-yard pool. Torres said TVRPD hopes to extend the season through the end of September. Lap swim will be open to the public Monday through Friday from 5 to 7 a.m. and 12:30 to 1:30 p.m.; Monday through Thursday from 7 to 9 p.m.; Saturday from 11 a.m. to 2:30 p.m.; and Sundays for private pool parties and rentals only. • Kathleen's Deep Water Aerobics will be held Tuesdays and Thursdays from 7 to 8 p.m. The workout will be for all fitness levels and men and women alike. • Marti's Water Aerobics will be held Mondays and Wednesdays from 7 to 8 p.m. The workout will be low-impact. From April 1 through Aug. 1, TVRPD will offer private swim lessons for ages 4 and older by appointment. Lessons cost $20 per 30-minute lesson, with a minimum of a five-lesson commitment. According to Torres, recreation swim for the summer will start the second week of June. For children younger than 4, TVRPD offers a Parent and Me class beginning in June. Summer swim lessons will also begin in June and will cost $70 for two weeks of lessons. "Summer swim lessons are always huge," Torres said. TVRPD will also offer American Red Cross Lifeguard Certification on May 4 and 5. More information can be found online at tvrpd.org. Said Torres, "Grab your towel and swim up at Dye Natatorium!" TVRPD offers a variety of payment options. Drop-in visits cost $5, and can be paid in cash at the door. Ten-visit punch cards cost $30, offering a $20 savings, and can be purchased at the door or at TVRPD's office location at 490 W. D St. Monthly unlimited passes are available for $55 and summer swim passes, good for June, July and August are available for $110. Passes are also available at both locations. Dye Natatorium pool is located at 400-B S. Snyder. For more information, call TVRPD at 822-3228. The office is open Monday through Thursday from 8 a.m. to 6 p.m., and closed Friday through Sunday.